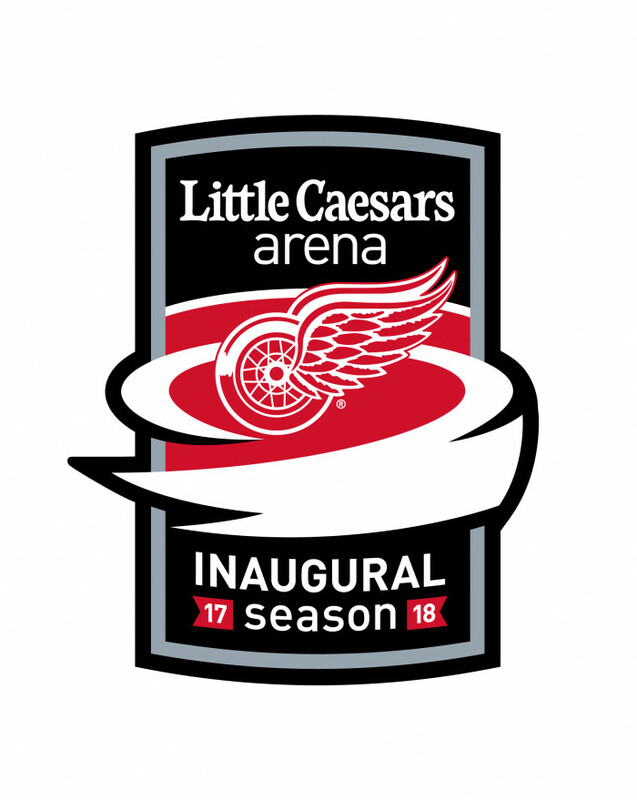 The Detroit Red Wings are proud to host the 2nd annual Hockeytown 5K, an exciting run/walk throughout downtown Detroit to celebrate the opening of Little Caesars Arena and the 2017-18 season. Join us Sunday, Sept. 10 for an amazing 5K run/walk like no other. 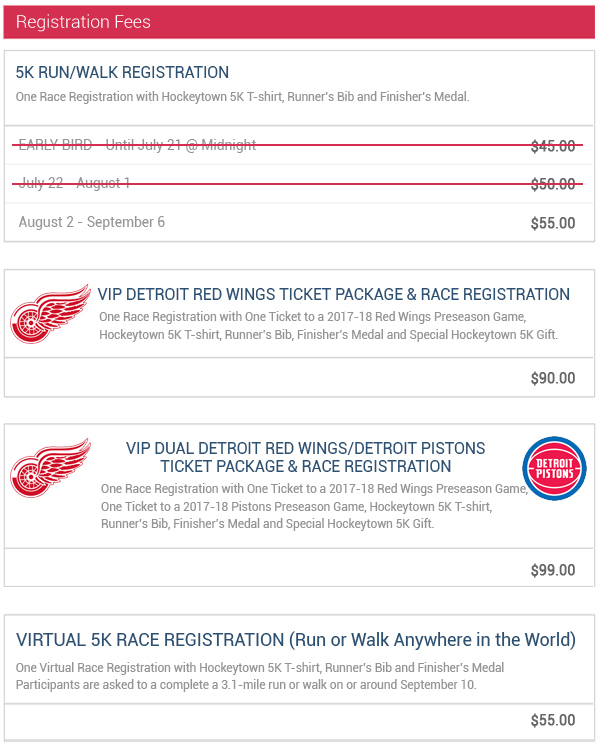 Come dressed in your favorite Red Wings jerseys and apparel and stroll down an incredible downtown Detroit course that runs through Joe Louis Arena and ends outside Little Caesars Arena. A portion of the proceeds benefit the Detroit Red Wings Foundation. Additional commemorative items can be added to your race registration package that include water bottles, jackets, hats and more! 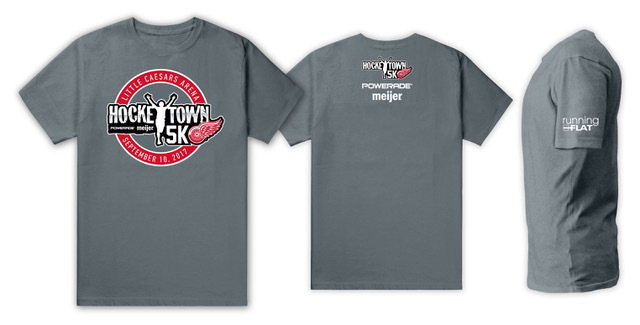 Please Note: The final Hockeytown 5K T-shirt and finisher's medal design will be unveiled at a later date. Runners start at 7:00 a.m.
Walkers start at 8:00 a.m. Runners and walkers will gather in separate start chute is in front of the FOX Theatre. 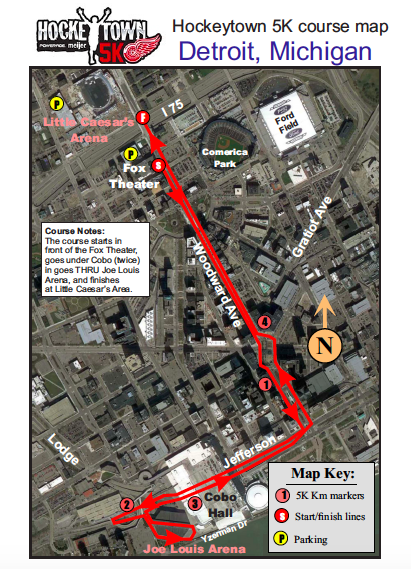 From there, the 5K will begin at 7 a.m. for runners and at 8:00 a.m. for walkers down Woodward Ave. to Jefferson Ave., then under the Cobo Hall tunnel, looping around to Yzerman Dr., before going through Joe Louis Arena from east to west on ice level. After going through The Joe, runners and walkers turn right onto Jefferson towards the Renaissance Center, left on to Woodward Ave. and back to the finish line outside Little Caesars Arena. Please Note: There will be race photographers on the course and at the finish line to take your picture. These photos will be posted online following the event. You will receive an email with your results immediately after you cross the finish line. You can review the full race results on Racemine.com where you can also view your finish line video that you can share with friends and family. 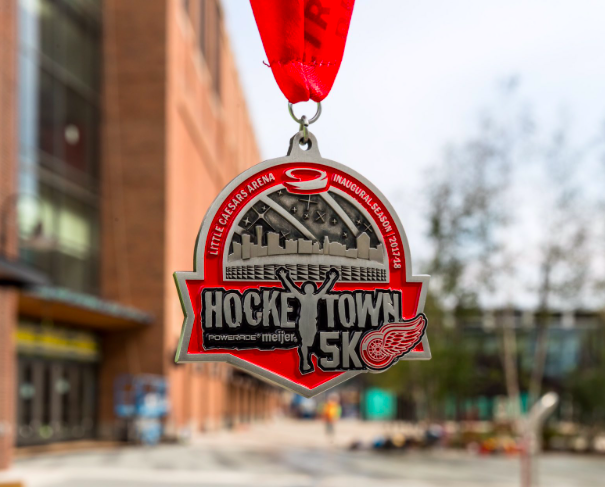 The Hockeytown 5K offers FREE pictures and video from the race. Our photographers will be strategically placed at the start, on the course and at the finish line. These photos will be available to view online 2-3 days after the race. RunningFlat will email your results immediately after you cross the finish line. You can review the full race results on Racemine.com where you can also view your finish line video that you can share with friends and family. Virtual 5K participants are asked run or walk 3.1 miles on or around September 10. Friday, Sept. 8 from 3:00 - 8:00 p.m.
Saturday, Sept. 9 from 12:00 - 8:00 p.m.
You will receive an email with your runner's bib number 2-3 days before race kit pickup. You must provide a valid proof of identification to pick up your race kit. If you are picking up for non-family members, you must bring their registration confirmation number. NO RACE DAY PICKUP - You must pick up your race kit on Sept. 8 or 9. There is no race day kit pickup available. Prizes will be awarded to the top three overall male and female athletes. Special Hockeytown 5K Awards will be presented for Best Dressed and Best Group. Prize details to be annouced at a later date. All friends and family can watch at designated spectator areas throughout the course, which will be announced as the event nears. 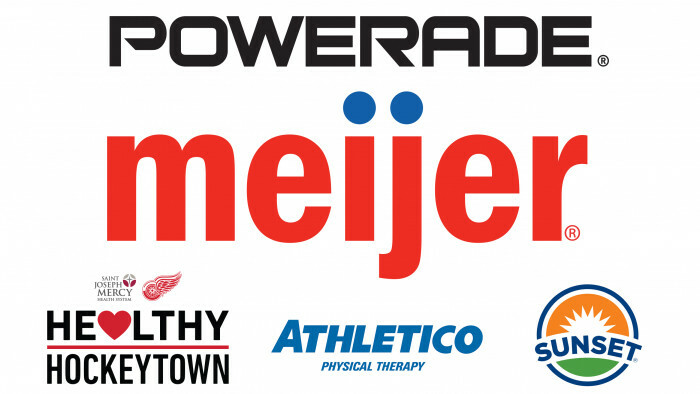 All parking lots and garages near Little Caesars Arena, Comerica Park and the local area will be available for Hockeytown 5K participants and spectators for a fee.